Now, we've recently moved into a little bungalow and are painting, decorating, and changing things up on a budget. I'm ready for some new bathroom ideas, and think this look may work for our bathroom! I like them a lot... I think they're pretty and girly and, at the same time, can go with a more contemporary or modern and cute look like in the Country Living image--I love the all-white look with a turquoise end table! I've put together a tutorial so you can follow along as I make a similar shower curtain out of simple white muslin. Let's get started! Standard shower curtains are 72"x72", square-shaped, with 12 buttonholes or grommets at the top. You'll need extra-wide fabric so that your curtain doesn't have a long seam down the center. Quilt backing fabrics come in extra-wide widths. I recommend buying 2.5 yards of 90" wide muslin. I bought mine with a coupon at JoAnn's and paid 50% off of $4.99/yard. You could also use a large sheet and make it over! Start by tearing your muslin into the right size. 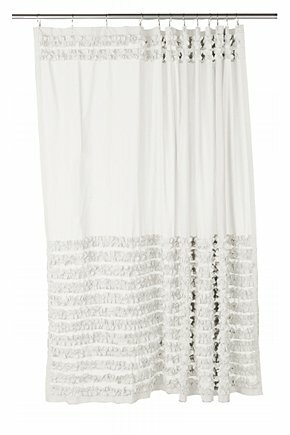 You won't need the full 2.5 yards in width, but you'll need 72" tall plus hems. Add 1" on both vertical sides for the little hems, so tear your big piece at 74" wide, along the length: you'll have one edge with selvage and one without. You'll need 2.5" at the top for a 2" hem, and 1.5" at the bottom for a 1" hem--that means, tear your fabric at 76" long. Keep the extra! The sewing: On your vertical edges (one is selvage, one is torn), press under just under 1/2" and then another 1/2". Sew. At the top, press under 1/2" and then 2". Sew. (If you have very thin fabric you may want to add a 2" wide strip of interfacing here, since you'll be adding buttonholes and it needs to take the stress of hanging). At the bottom, press under 1/2" and then 1". Sew. At the top, you'll need 12 buttonholes or grommets ___ apart. I'm doing 1" long buttonholes, but do whatever you like. Make them start at least 3/8" from the top so that your curtain liner is covered at the very top. Okay, now for the ruffles!! You had 9" extra after tearing off the 76" length for the curtain. Cut this 90" wide piece into three 3" long pieces. Now, you'll use some of the extra from the selvage lengths of the fabric. It's a little weird to use some fabric on the grain, some against, but for ruffles it'll be okay. You wouldn't do this with clothing or anything. Cut three 3" wide pieces the length of the fabric (2.5 yards). Sew one 90" long piece to one 2.5 yard long piece. Do this three times to make three equally long pieces. Press open. Now it gets a little tedious. Zig-zag along the raw edges of all three long pieces, top and bottom. You could turn under 1/4" and then again 1/4" to make small hems, but gosh, that would be a LOT of pressing and sewing. And you'd want to make wider ruffle pieces to begin with. Zig-zagging is easier, and I don't mind the romantic-but-casual look the partially raw edges give. Gather 1/4" (the width of the presser foot) from one side of the ruffle pieces, all three. To gather, use the largest stitch on your machine and a very high tension. Now, to place the ruffles. Depending on the pattern you want, you can sew your ruffles on wherever and it will look pretty! 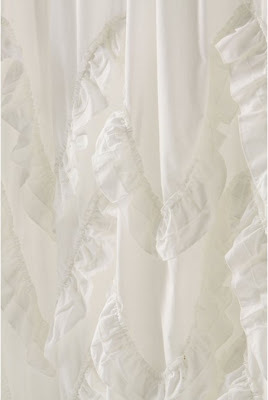 But I'm sort of going with the wavy ruffle pattern like Anthro's curtain, so I'll give instructions for that version. 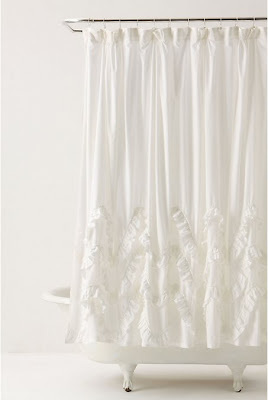 Fold your curtain into thirds so you can mark off, with pins or fabric pen, the bottom third of your curtain. That's where most of the pattern will be. See my fabric pen dashed line there? It looks like the ruffles on Anthro's curtain have six peaks. So, I found six evenly distributed points on the curtain by folding it in half, then thirds and marking. From there, you'll need to pin on and then sew down your ruffles. I did this by finding the approximate center of each ruffle, and pinning it to the center of the curtain. Pin the outsides down, and continue this half way technique at other points: 1/4, 1/8. If your gathering stitch was even throughout, you should have evenly distributed ruffles. But, all machines are different, so you may have to stretch out or gather up more to get your ruffles spread out evenly on the waves. Then, sew down. All done! 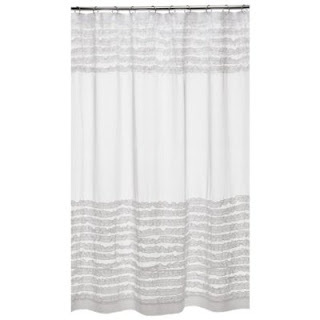 Hang over a light-colored or clear shower curtain liner. The bathroom's not done yet, so I can't really show you how it looks in the room yet! But there it is hanging. WOW. thats amazing =) I might just try this. But am thinking colorful ruffles! love it!! turned out awesome! Beautiful! Can't get enough of the ruffles! ahh! 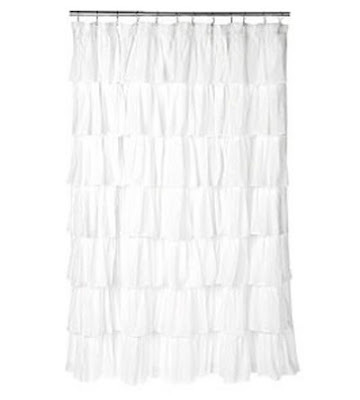 i've been eying those ruffle shower curtains for so long but could never fanthom shelling out so much money for something I was sure I could make on my own. Instead of trying though I settled for a waffle textured shower curtain. Now I'm going to try making one though, thanks for your tutorial!! It looks great & I like the waviness. I cannot wait to try this! Thankyou!!! What a great project. I wish I had a place to put one! beautiful!!! I love it. So romantic and pretty! Wow! What an amazing job! 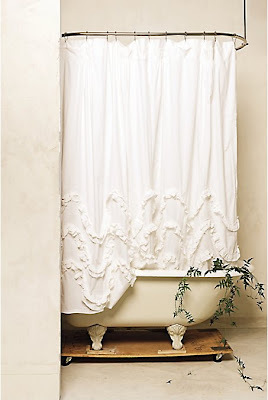 I adore the shower curtains! I love your version, it's gorgeous! Thanks so much for the how-to, I'll be linking. That is great! 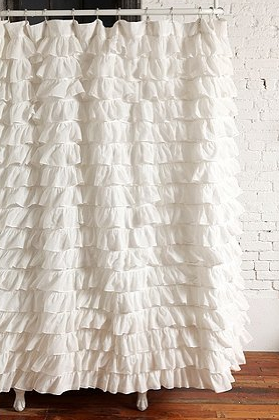 I think I'd try to do it wiht color though, my hubby would think the white ruffles were too girly! Thanks for the tutorial. P.S. I love all the Civil War re-enactment pics. When I was younger they were my favorite thing to visit in the summer. The dresses were so awesome! Wow! I LOVE it! I saw the pics a long time ago and saved them to try to do of buy something similar. Thanks so much for sharing. If I manage to make one, I'll link it back to you. Lovely! 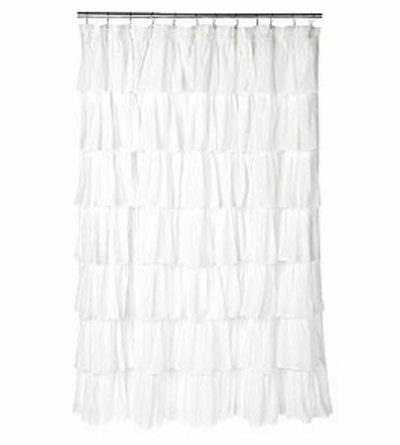 My daughter wants some curtains like that (we saw them in Crate and Barrel) now I feel like it's not going to make me crazy creating them! How lovely! I love the idea of using muslin. I like the wave pattern. I love this! I am featuring it on CrazyDomestic.com this Tuesday! Thanks for the fun idea! This is lovely! I finished my curtain using this pattern. Big thank you for posting it.